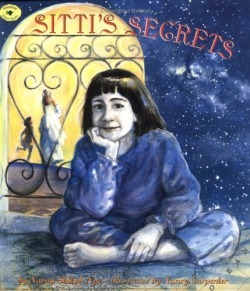 Show students the book Sitti's Secrets by Naomi Shihab Nye (distribute copies to students if you have enough…if you’re not using Sitti’s Secrets, use one of the titles listed above. The rest of this unit will refer to Sitti’s Secrets.). Explain that this story takes place in Palestine. Ask students if they know where it is; you might ask someone to point it out on a map or globe. Further explain that the people they will read about are called Arabs. Suggest to students that as they read the story, they look for similarities and differences between the culture represented in the book and their own culture. Ask children whether they are of Arabic descent or whether they have any friends who are. What do you think the book might be about? What is happening outside the window? What do you think the girl is thinking about? How is the girl like you? How is the girl different from you? Look at the inside cover. How is the little girl being silly? What are some things that you do that are silly? On the first page, Mona is thinking about her grandmother. Why do you think the illustrator drew a world map on the page? Mona calls her grandmother "Sitti"which is Arabic for grandmother. Have children share names they have for their grandmothers. The pictures show where Mona's Sitti lives and how she dresses. Have students describe the similarities and differences between Sitti and their grandmothers. Mona's grandmother calls her "habibi" which is Arabic for "darling." What are some names your grandmothers call you? Mona will also talk about her cousins. Their names are Fowzi, Sami, Hani, and Hendia. What are some of your relatives' names? In the story, Mona and her cousins play marbles. What are some games that you play with your relatives? Page through the book and find the hidden images within the illustrations. Allow for individual and unique contributions. Images to look for include (but are not limited to): a globe, the ocean, fish, a city, family faces in the leaves of the tree, the desert in the sheets, barbed wire, Arabic writing, and planets. Wonder aloud with students about messages the illustrator may be trying to communicate with these symbols. Following this discussion, read Sitti's Secret aloud or have students volunteer to read. Have them develop and generate observations and questions they may have about its content. List the students’ questions and comments on the board, or on large chart paper that can be displayed until the end of the unit.